This chapter works toward a four-part model of online ethos connecting classical rhetorical theory to the new age of computer-mediated technology with particular attention paid to the challenges, complications, and possibilities of this evolving rhetorical environment. This model demonstrates the usefulness of updating our understanding of ethos and its place in computer-mediated communication (CMC). 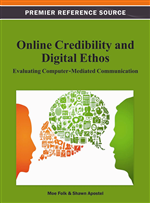 The proposed model allows for the assessment of digital ethos by examining others’ attempts to develop an online identity based upon: (1) Community Identification and Goodwill, (2) Moral Character and Virtue, (3) Intelligence and Knowledge, and (4) Verbal and Design Competence. The Greek and Roman rhetorical traditions serve as important touchstones for our discussion of credibility and character. Aristotle is probably one of the most systematic thinkers in this area, but even he has been shadowed by others. Homer, in the Iliad, was the first to offer a basic account of character. While Homer did not develop such an explicit theory of ethos, we can speculate on what traits of character were esteemed in pre-Aristotelian times by carefully reading the stories of his protagonists and antagonists. Homer (trans. 1939) stated in the Iliad, for example, that King Nestor was “that grand old man whose counsel was always thought the best. He spoke with honesty and good courage setting out his thoughts neat and clear, like a weaver weaving a pattern upon his loom” (p. 104). Homer suggested in the Iliad, for instance, that character is highly valued and fully realized in public contest. We know Nestor best when he is giving advice, in moments of agon, to kings and warriors about the war and to Achilles when arguing with Agamemnon or slaughtering soldiers on the battlefield. The Homeric character exuded wisdom, courage, style or eloquence, patience, foresight, bravery, skill, circumspection, honesty, and graciousness, always during times of conflict. Homer’s focus on character as an element in persuasion was an anchor for more advanced conceptualizations of ethos found centuries later. His version of character, according to Rowe (1983), centered “on the demands of the individual rather than on those of society in the broad sense” (p. 269) and assumed that the man of good character is good insofar as he is useful. As Yamagata (1994) has put it: “a man useful in battle is a good man” (p. 222). Yet, a positive character is an ends, not a means or a rhetorical tool that is explicitly used to gain power or prestige. Homer’s notion of character assumed as important that which Aristotle explicitly excluded—the idea of prior action and reputation. According to Homer’s proto-theory of character, there is an impact on a man’s ability to be listened to, to be taken seriously, to be regarded as worth attending to, by his reputation for wisdom, or perhaps solely of his age precisely because it is perceived as a sign of wisdom, sagacity, “fair-mindedness,” and good counsel.